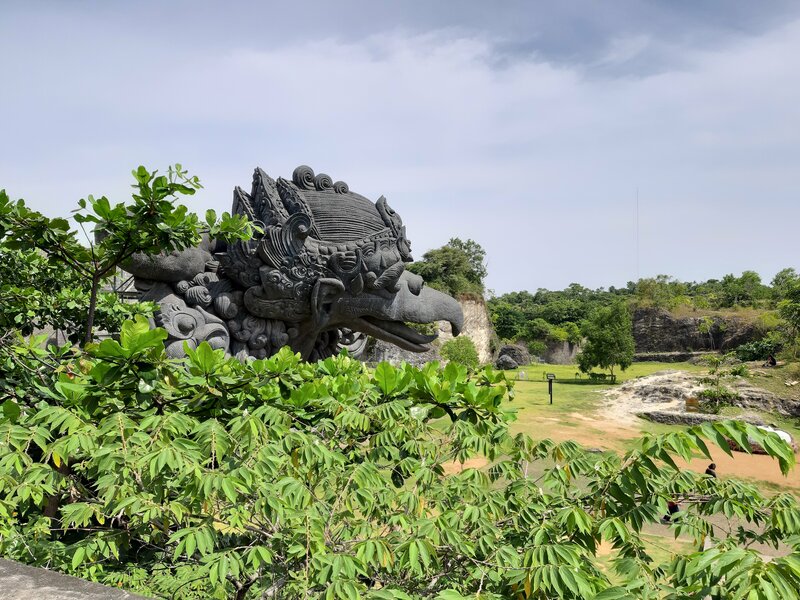 Garuda Wisnu Kencana (GWK) is an enormous statue that can be seen from all over Bali. From many places, it just looks like an enormous square-ish block, and for most of my time in Canggu, that’s all I saw. 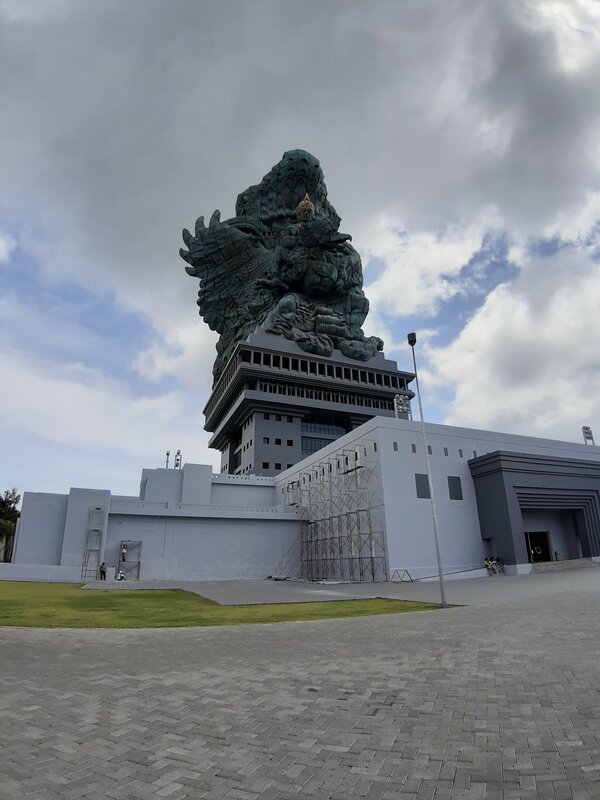 Whilst driving to Jimbaran to extend my visa, we crossed the Bali Mandara Toll Road - a vast 12.7km long bridge spanning the Gulf of Benoa - and received a clear view of the statue. We decided to visit. I knew very little about GWK before I visited it. Oh, by the way, Indonesians say GWK like ‘Gay-Way-Kah’. GWK had first been pointed out to me by a local girl who was selling bracelets on the beach in Canggu. 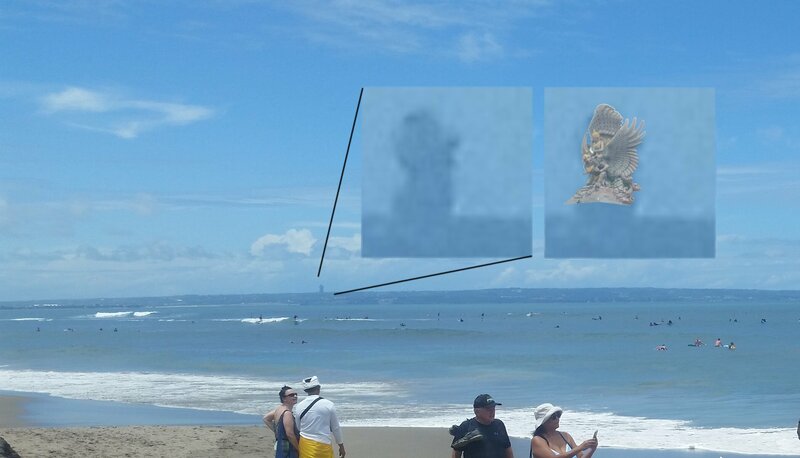 She told me that it was a statue, but I wasn’t sure I was understanding her correctly; from Canggu, it was hard to make out as anything more than a lump rising above the landscape. That lump could have been anything, and did not look like a statue. Admittedly it was a very big lump, I just couldn’t make out any details. She confirmed that “Yes, that ‘lump’ is a statue, sir!” Well, okay then! Sorry to offend you, but this is my first time hearing about it! I zoomed and edited this picture for you so that you can get an idea of how GWK looks from Canggu. 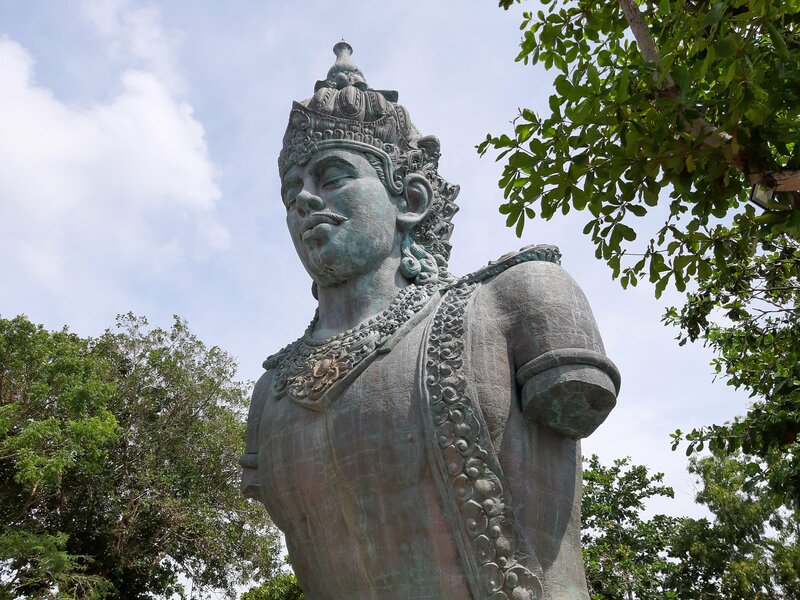 Three weeks later and I was zipping down the Bali Mandara toll road, and I caught sight of the statue again. 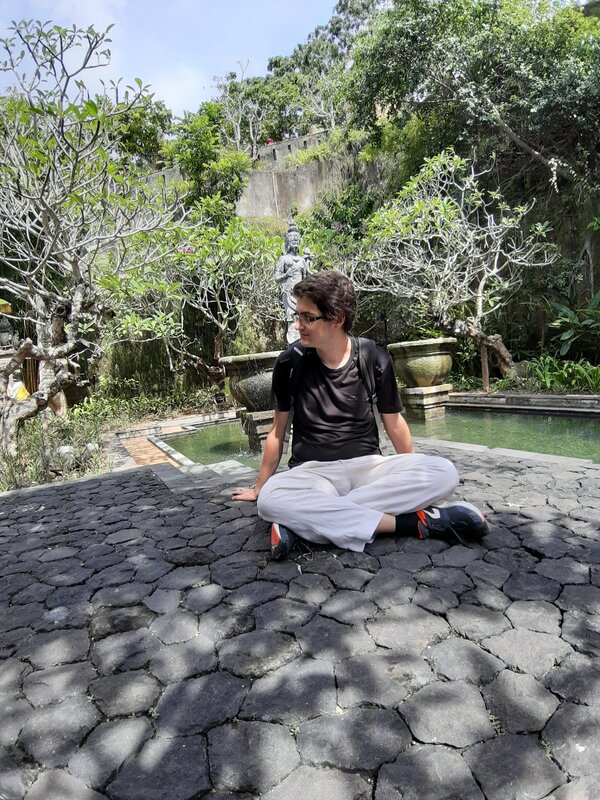 From Bali Mandara, GWK looked a lot more interesting and a lot less lumpy, so we decided to visit. I actually still didn’t know anything about GWK when we decided to visit - not even it’s name. The child-like part of my brain merely said “Wow, cool statue!” and told the rest of my brain that it wanted a closer look. I actually had the misconception that GWK was an old (ancient?) statue. It might be naive of me to think that ancient peoples could create a massive statue and that I wouldn’t have heard of it, but weirder things have happened. But no, it’s a modern statue that just looks really old; it was actually only finished last year after three decades of planning and construction. The project was stalled for a decade and a half from the late 90s until 2013 because funds ran out. Luckily a property developer agreed to fund the project in 2013. Otherwise Bali might have ended up with yet another abandoned project like the Ghost Palace Hotel. They say that GWK is ‘finished’, but I’m not sure it’s a word that I would use to describe GWK as a whole. But I’ll get to that later. GWK is actually described as a ‘cultural park’ - it’s more than just the statue. After doing what we needed to do at the Jimbaran Immigration Office, we were considering heading straight to see GWK, but decided to stop in to enjoy some food first. We found Giridhari Warung - a 100% vegetarian restaurant - close to the GWK park, and decided to eat there. I think Giridhari might be visited by foreigners quite often, as there were a couple of bule couples eating there. Our food took quite a while to come, but it was refreshing to be able to order anything from this Indonesian menu and feel comfortable eating it. We ordered Nasi Campur, which is white rice with small portions from many other dishes - we had a lot of variety on our plates, including tempe, vegetables, sate, and sambal! A trend that I’m starting to notice with Balinese parks is that they all have sculptures of animals. As you enter GWK, you’ll pass statues of deer, frogs, salamanders, and more creatures too that I since forgot. Eventually you’ll reach an inner area where a security guard will ask what Nationality you are, and give an advisory price slip to take to the ticket office. 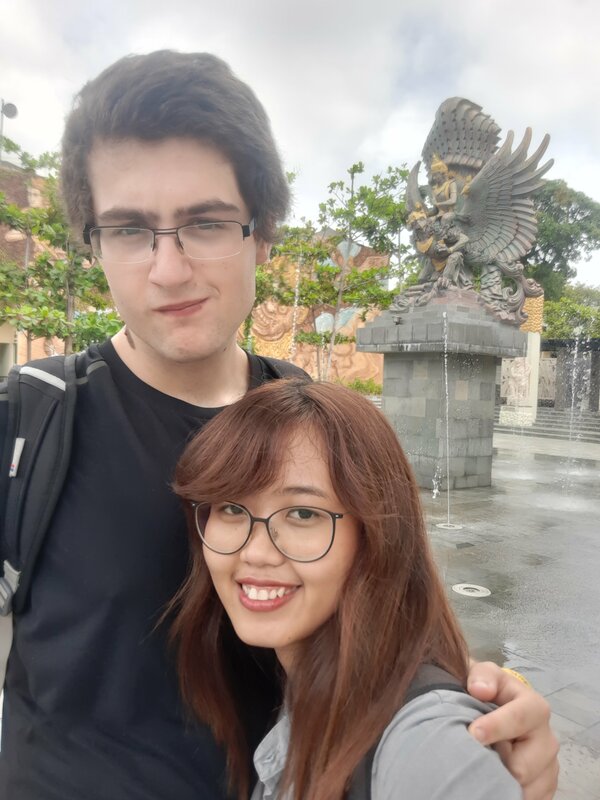 For us, we were charged 205,000 rupiah (£11.11, €12.86, $14.49) - 125,000 for me, 80,000 for Ni. The ticket was more expensive for me because I am a foreigner. Or alternatively, perhaps it was cheaper for Ni because she is Balinese. Courtyard with a smaller version of the GWK statue. Once inside the park, there’s a smaller version of the statue in a small plaza. The statue is surrounded by jets of water that pulse on and off as part of a water feature. It was here that Ni told me ‘The Story of GWK’. There were little busts of the involved characters that she could point to. Vishnu is a god who fights injustice and evil. He had manifested as Rama, and was searching for his wife Sita, who had been kidnapped by Rahwana, an evil spirit. Garuda, a legendary bird creature, agreed to let Vishnu (as Rama) ride on itself to save Sita from Rahwana. The main statue at GWK depicts Rama riding Garuda. 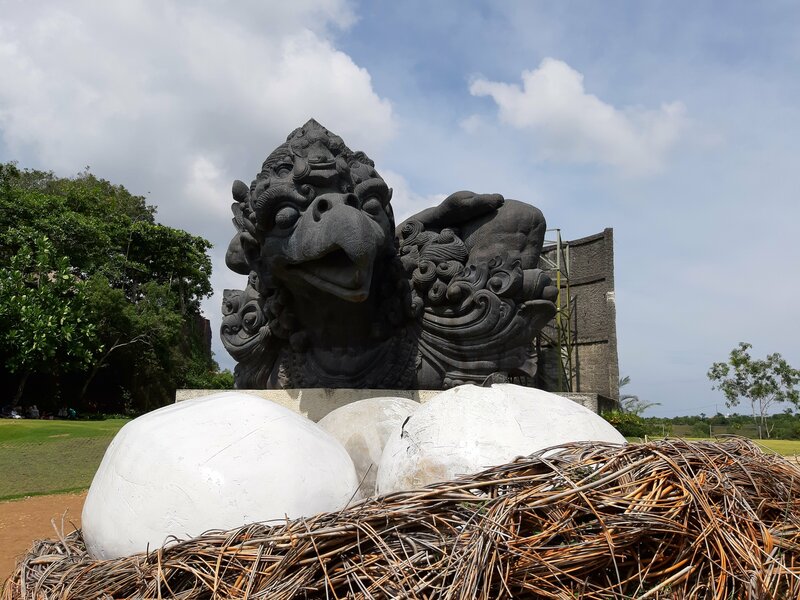 In the GWK Cultural Park, there are also other (smaller) statues of Garuda with it’s eggs, and Vishnu alone. We visited all three. The cultural park itself has various (fairly empty) courtyards that lead to the main statue - the main one is called Lotus Pond, but I didn’t see any lotuses nor ponds. The courtyards really felt like something was missing, and it immediately gave me that impression that perhaps the park was low on funds. The courtyards are surrounded by sheer limestone rock faces; the rocks have marks which implied to me that the space had literally been carved out from solid rock by big diggers and machines. To one side of the park is an amphitheatre; I briefly saw women dancing in traditional Balinese clothing as we passed by, but we didn’t end up going inside. We visited GWK a week after Nyepi. The Lotus Pond courtyard contained six Ogoh-ogoh - statues of demons that villagers create for the Nyepi festival - in little tents. Because these Ogoh-ogoh had been created purely for tourists by the venue rather than by passionate villagers, I wasn’t as interested in these Ogoh-ogoh as I was in other Ogoh-ogoh, but I still looked at each one and took pictures all the same. Ni was familiar with some of the beings that the Ogoh-ogoh were representing, and she told me about some of their stories. One of my favourite of the Ogoh-Ogoh at GWK. Apparently nobody wanted to marry this girl because she was deformed, so her mother (standing on her shoulder) cursed the people from their village. Harsh. After viewing the Ogoh-ogoh, we made our way towards to main statue. It was quite hot on the way so we bought fresh mango juice, which was delicious. Jus mangga enak! Approaching the GWK statue through a thin limestone corridor. I’ll be honest; the main statue is actually fairly disappointing. It’s made of copper and brass which has rusted considerably to become a big green blob where it’s hard to distinguish the details. Also, much of the height of the statue comes from the base, which is a very plain looking grey cubic building. I might even go so far as to say that the base is unfinished because it looks so dull. I feel that this belief is justified because there was scaffolding in several places around the site. That said, it’s the 16th tallest statue in the world, coming in at 75m tall (or 121m when including the base). So it’s not really something to be sniffed at. But it didn’t really ‘wow’ me. The GWK statue and its ugly grey building. There’s a (very) small museum inside, which shows the progress of the development of the site in pictures; there are photographs of the initial proposals being presented to the Indonesian President in 1990, computer-generated concept art and plans of the site (many of which seemed more interesting than the reality and included features like waterfalls and lakes…), photographs of the ground-breaking ceremony in 1997, photographs of the construction process, and photographs of the inauguration by Indonesian President Jokowi in late 2018. Inside the GWK museum at the base of the statue. Much of the space is cordoned off by temporary-looking walls. 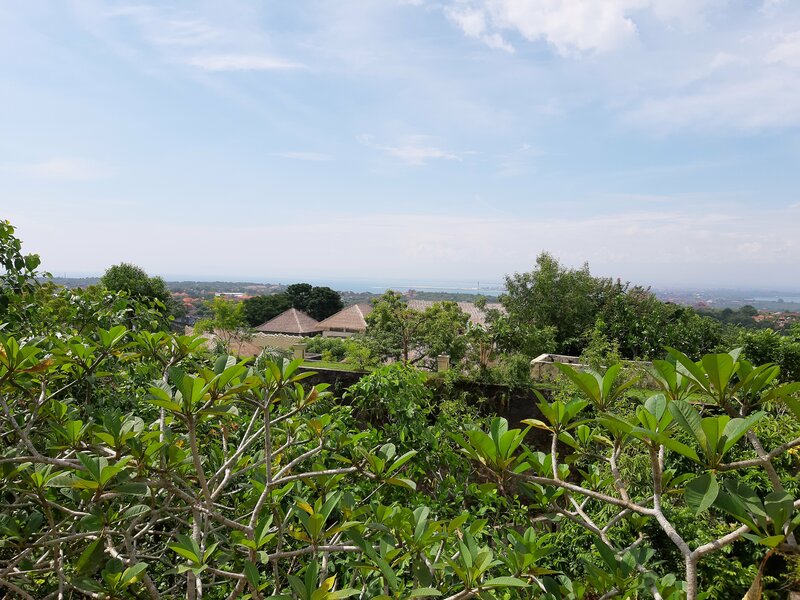 I had the impression that it would be possible to ascend (at least part of) the statue to view Bali from above. The building under the statue has windows facing in all directions. Traditionally statues like GWK have viewing platforms - you can look out of the crown of the Statue of Liberty, for example. However, we found out when we got to the statue that it wasn’t possible; at least not yet. 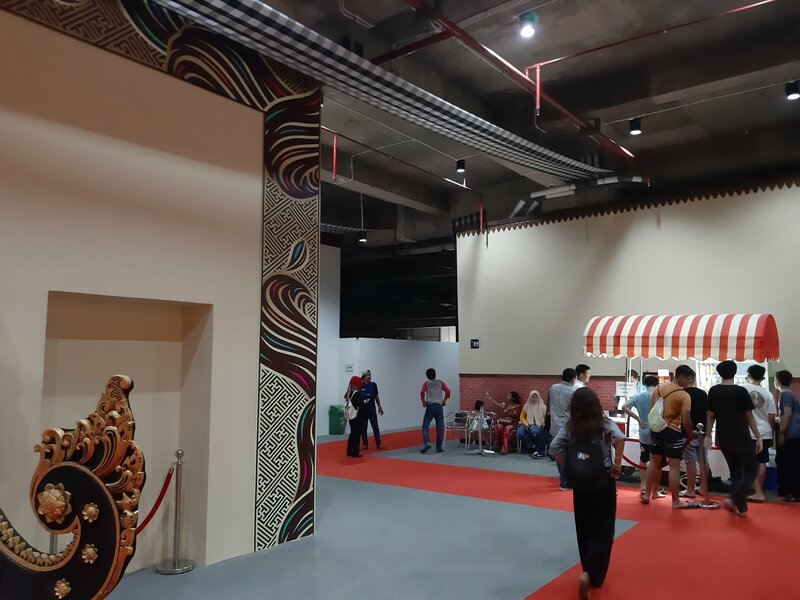 The only accessible part of the building was the ground floor museum and a nearby small area which was dedicated to a single concessions stand and a bathroom. After being disappointed by the main statue, we went back to the Lotus Pond courtyard, where there is a large statue of Garuda at one end. I found a spot that I really wanted to take a photograph of - Garuda’s eggs were in the foreground and Garuda was in the background. But people kept getting in the way! Most people wanted to take photographs of their own, but frequently it was just a Chinese guy wandering around talking on his phone getting into my shot. I kept seeing little 5 second windows where I would be able to take the photo, but by the time the camera on my phone had responded the opportunity had passed. At one point I was in the middle of taking the photo when a group of teenage girls appeared from behind me and started climbing on the eggs. Argh! I got a little frustrated but eventually I was able to take the photograph that I wanted in the end. Worth it?! By now Ni was getting pretty annoyed too. It was really hot and neither of us were wearing sunscreen as we hadn’t expected to come here. She was also at the start of her period, which didn’t exactly make her feel great! To the left of the Garuda statue was another statue of Vishnu that I could see at the top of the stairs; I wanted to spend time looking at that but Ni just wanted to leave; we compromised and agreed to look at it on our way to the exit. Garuda from the top of the stairs. The Vishnu statue was on a platform that was fairly high up, and it had a great view. We sat in the shade for a little while to cool down. View from the Vishnu Statue platform. There’s a set of stairs with a sign that says ‘park entrance’. 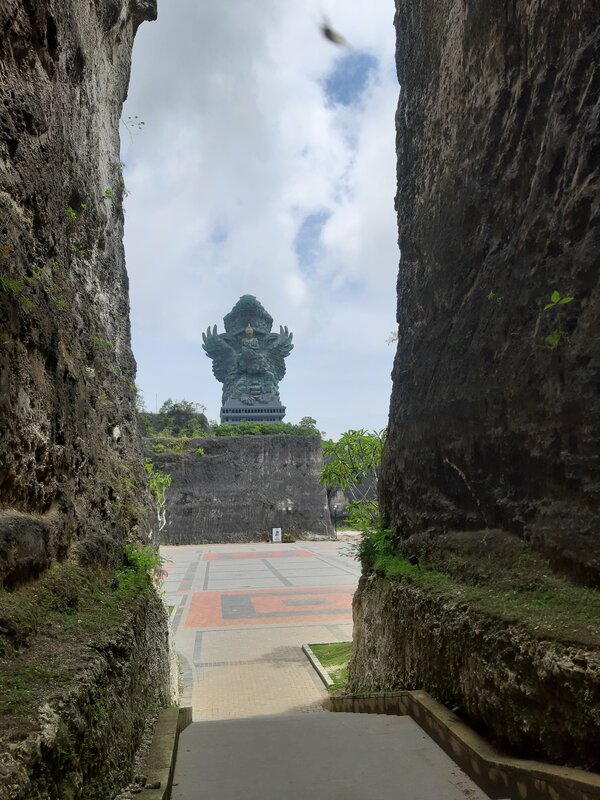 Nobody was taking those stairs so I think most people visited the small Vishnu statue before they visited the main Garuda Wisnu Kencana statue (and hence weren’t ready to leave). 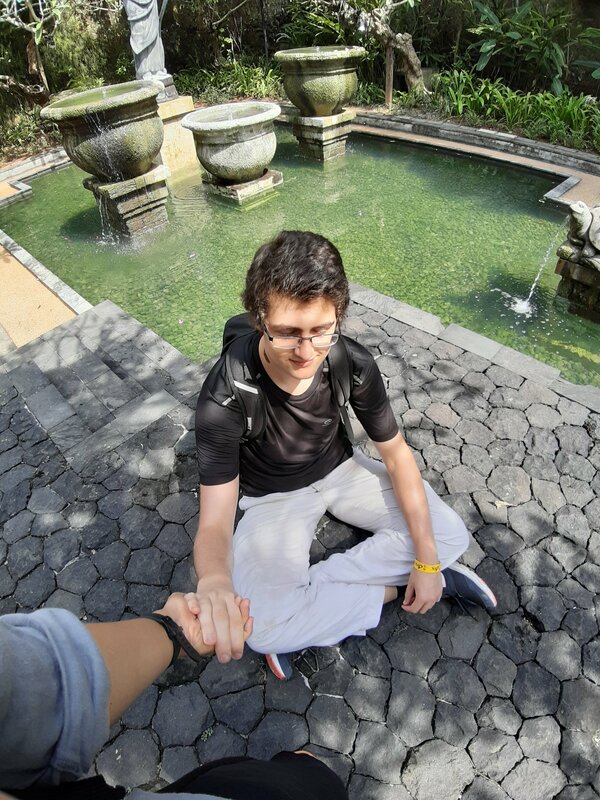 There was a really relaxed pool of water with statues on the way to the exit. There were wind chimes and little bits of fabric blowing in the wind, plus the sounds of the trickling water from the placid water feature. Everything suddenly felt really peaceful, and we both wanted to sit there for a little while. I closed my eyes, sat back, and enjoyed the moment. Relaxing by the pool at GWK park. Ni told me that this little pool area reminded her of Ubud. 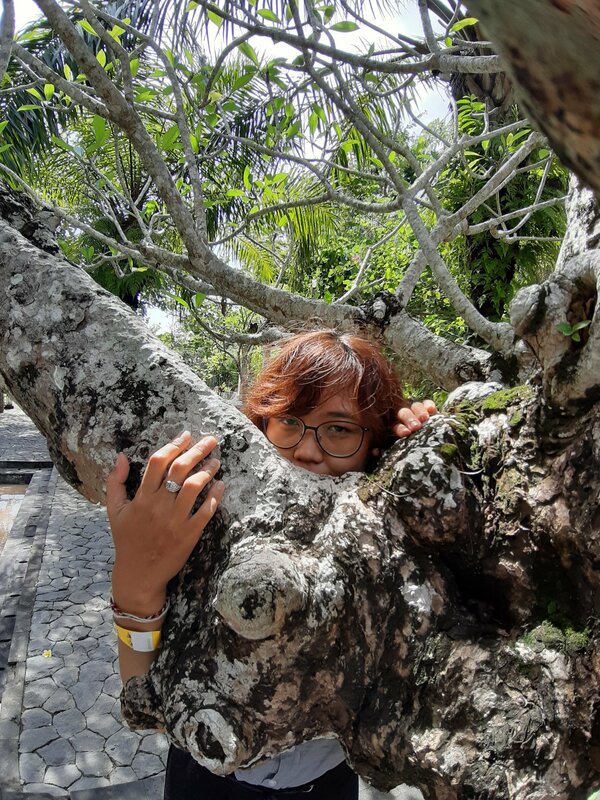 Ubud is a village in Bali that is popular with foreigners. It’s famous for meditation, hippies, and free-thinking peoples. Sadly I wouldn’t get an opportunity to stay in Ubud during this trip to Bali, so this park just had to fuel my imagination. Eventually we decided that it was time to leave. 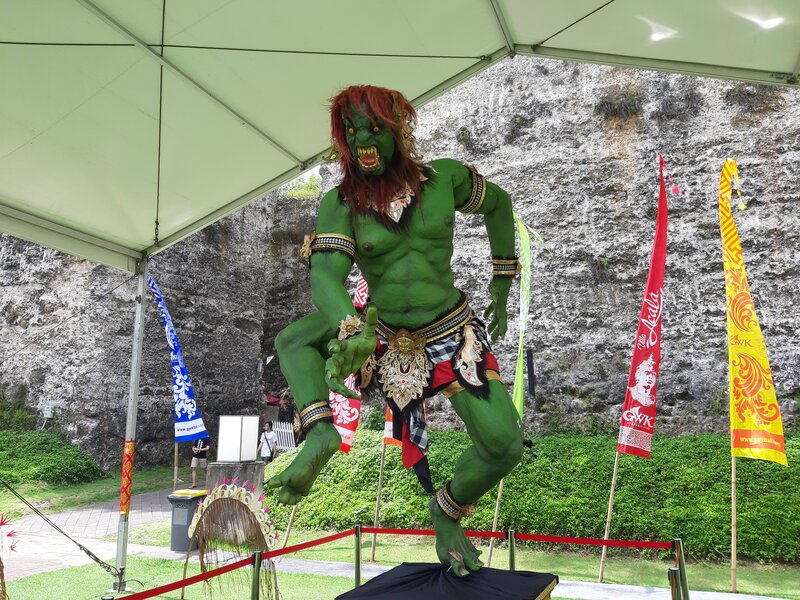 All in all, I wasn’t really impressed with Garuda Wisnu Kencana cultural park. 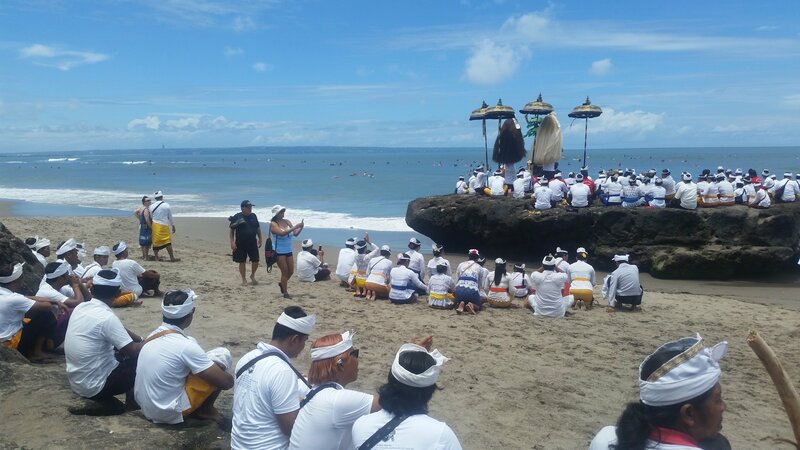 I’ve read that there are hopes that it (and it’s statue) will become a beacon for tourism in Indonesia - and Bali in particular - and that the statue will become a kind of mascot. As of right now, I feel that the park is too empty; the statues can only hold your attention for the briefest of times, so I’m not sure it will have enduring hype from tourists. My assessment may be premature as the site may have more development planned that could round things out. I looked at the website for the GWK park, and in many places they talk about the capacities of the different spaces of the park. Used as a venue, I can see GWK cultural park having great success. The park would certainly make for an interesting backdrop for a concert, festival, or function, and the scenery wouldn’t have to hold all of you attention as there would (presumably) be a main event/attraction for that. This might be why GWK cultural park felt like there was something missing for me (and why it felt so empty); it was missing an event to host.